The Blue 52 workforce housing on Monday, April 16, in Breckenridge. Applications are now being accepted for people interested in the second phase of the housing development in Breckenridge. What follows is an anticipated schedule for the second phase of the Blue 52 workforce-housing neighborhood in Breckenridge. These dates could be subject to change. For updates, go to Blue52Breckenridge.com. Now-May 16 — Applications will be accepted. People may download forms from the website or pick up copies from the Summit Combined Housing Authority, 110 Ski Hill Road, Breckenridge. June 1 — A lottery will determine which applicants are awarded contracts. June-July — Approved buyers will enter into contracts for their homes. There will be a $2,500 non-refundable deposit due at this time. At closing, the deposit will be put toward the down payment. July-November — Buyers will close on their homes and move in. Down payments and funds from lenders are due at closing. 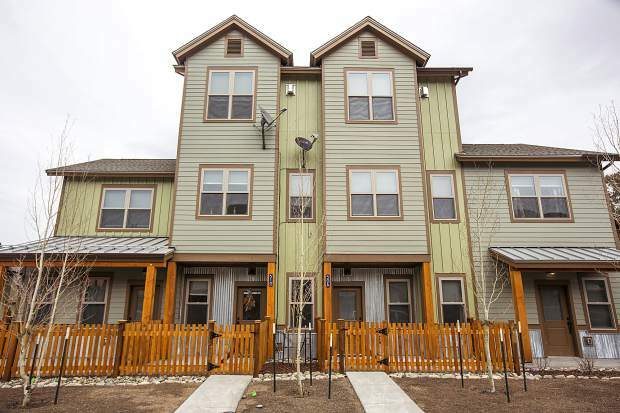 The sales team in charge of Breckenridge’s newest string of workforce-housing units is taking applications now through May 16 from people who work in Summit County and might want to own a home here, too. The application process is to precede a planned lottery, currently scheduled for June 1, after which time those who have applied will learn if they’ll be offered contracts to close on one of the homes, likely sometime in June or July. Overall, the Blue 52 neighborhood will contain 52 new housing units. Seventeen of them went up in phase one, and the remaining 35 are set for phase two. According to Leah Canfield of Coldwell Banker Mountain Properties, the local firm that’s working with the town to sell the homes, many of the people who applied for units in phase one landed exactly what they wanted. While interest remains intense, having almost twice as many available homes for round two means that even more people will likely get into the units they desire, she said. To download an application form, go to Blue52Breckenridge.com. The website also contains price points for the different units, a list of preferred lenders, floor plans and information about the different finishes, along with copies of the deed restrictions, HOA documents and more. The Blue 52 workforce-housing project stems from a voter-approved ballot initiative. Now, the new locals neighborhood is coming into its own with the sales team releasing an estimated timeline for the second and final phase of Blue 52 homes. The project got its name from a naming contest, in which a combination of the number of homes on the property, previously referred to as Denison Placer, and its close proximity to the Upper Blue River emerged as the winner. Altogether, the second phase at Blue 52 will feature 25 two-bedroom units, five one-bedroom and five three-bedroom townhomes, ranging in price from $249,000 to $515,000. All of the three-bedroom townhomes, which command the highest prices, will come with two-car garages. Most of the two-bedroom units will feature single-car garages, and dedicated surface parking will be included with the one-bedroom properties. The homes without garages have private storage rooms on-site. Income caps, which have been put on 20 of the 35 homes, including all of the one-bedroom and some of the two-bedroom units, range from $87,000 to $114,240 annually. There isn’t much room for customization of the units, but each of the 35 homes will feature one of three finishes — standard, upgraded or premium — depending on the size and listed price of the home. Offering multiple finish packages — all of which are pretty plush, according to the sales team — helps anyone who might have a little extra money buy into an elevated package with upgraded amenities like granite countertops and wood floors, just to name a few, without having to pay top dollar for a custom-built house. Additionally, the higher priced units help offset losses incurred building the cheaper ones. According to Laurie Best, the town’s housing manager, the ultimate goal here is to deliver a wide range of housing units at a variety of prices, all of which helps local workers stay local. “That’s what makes us a real town and distinguishes (Breckenridge) from a lot of other communities that get hollowed out,” she said of the town’s ongoing efforts to create more workforce housings. In a related move, Breckenridge Town Council also recently voted to increase the rental-rate restriction, allowing someone who purchases a deed-restricted home to rent out a room inside of it for up to $850 per month. The home itself cannot be rented out, but the move was designed to give someone who purchases workforce housing with the plan of having a roommate help offset payments a little more room financially to make such an arrangement work. In an additional selling point for the neighborhood, construction is expected to begin soon on River Park, which sits right next to the Blue 52 workforce neighborhood. Work on the new park will start in the coming months, and homebuyers should be prepared for continuing construction this summer both at Blue 52 and at River Park, according to the sales team. However, once complete, the families at Blue 52 will have a new nearby amenity that has many people who live much farther away excited about the project. There will also be trail and walking path connections for convenient options to get to nearby jobs or recreational opportunities.